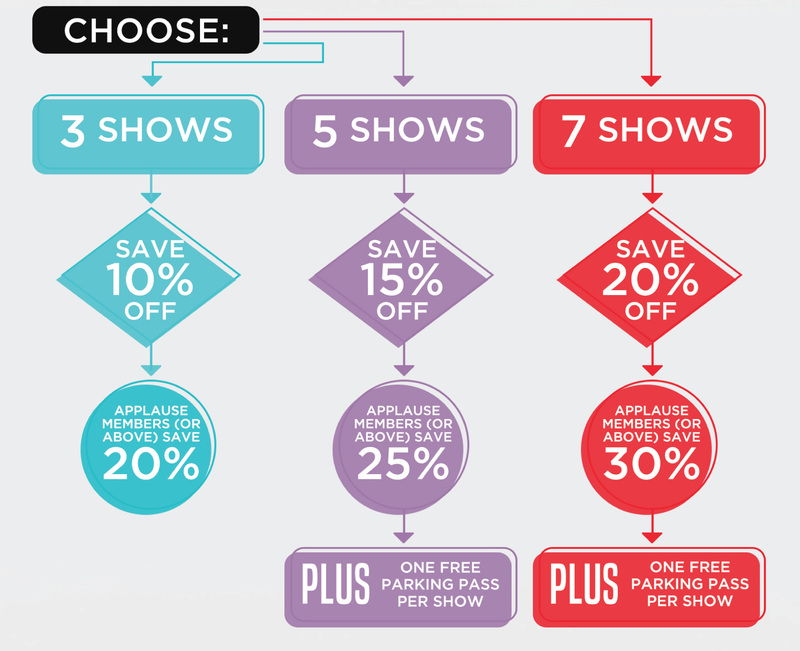 Become an Applause Member (or above) and you'll access a 10% bonus savings on your Subscription (when you selected 3+ shows). Subscription packages can be made from many of the following shows. Exclusions include, but are not limited to: Brew Five Three, Conservatory programming, free community events, Film Focus, and Kaelidoscope. For questions on these, and other exclusions, please call the Box Office directly at 253.591.5894. Sunday, April 28, 2019 at 7:30 p.m.
Friday, May 10 at 7:30 p.m.
Sunday, May 12 at 3:00 p.m.
Friday, May 17 at 7:30 p.m.
Saturday, May 18 at 3:00 p.m.
Saturday, May 18 at 7:30 p.m.
Sunday, May 19 at 3:00 p.m.
Friday, May 17, 2019 at 7:30 p.m.
Saturday, July 20, 2019 at 7:30 p.m. Preview Night: Thursday, October 17 at 7:30 p.m.
Friday, October October 18 at 7:30 p.m.
Saturday, October 19 at 7:30 p.m.
Friday, October 25 at 7:30 p.m.
Saturday, October 26 at 7:30 p.m.
Sunday, October 27 at 3:00 p.m.
Saturday, November 2 at 3:00 p.m. & 7:30 p.m.
Sunday, November 3 at 3:00 p.m.
January 30, 2020 at 7:30 p.m. Preview Night: Thursday, February 6 at 7:30 p.m.
Friday, February 14 at 7:30 p.m.
Saturday, February 15 at 7:30 p.m.
Sunday, February 16 at 3:00 p.m.
Friday, February 21 at 7:30 p.m.
Saturday, February 22 at 3:00 p.m. & 7:30 p.m.
Sunday, February 23 at 3:00 p.m. Preview Night: Thursday, March 26 at 7:30 p.m.
Friday, March 27 at 7:30 p.m.
Saturday, March 28 at 7:30 p.m.
Saturday, April 4 at 7:30 p.m.
Sunday, April 5 at 3:00 p.m. & 7:30 p.m.
Saturday, April 10 at 7:30 p.m.
Sunday, April 11 at 3:00 p.m. & 7:30 p.m.